More companies are turning to social media as a way to communicate with their customers, and Hootsuite is working with Microsoft to make that even easier through an integration with the company's products. The social media management platform, which offers companies a variety of tools to better work with their social media presence across services including Twitter, Facebook and Instagram, on Tuesday announced new ways to connect to Dynamics CRM Online, SharePoint and Yammer. First off, users will be able to identify leads, opportunities and cases from social media posts in Hootsuite and then put them directly into Dynamics where they can be acted on by a sales or customer service team. Users can also attach social data to a customer's record inside Dynamics so that it's possible to have a fuller (if creepier) picture of who a company is selling to. Integrating Dynamics with Hootsuite is an important move for Microsoft. The smaller company already has an integration with Salesforce, which Dynamics is competing with in the CRM market. That integration should also help companies that use Microsoft's customer management tool, since customers are increasingly taking to social media to discuss their experiences with companies. Hootsuite's connection with SharePoint lets users save social media posts from networks like Twitter and Facebook to public and team Sites. 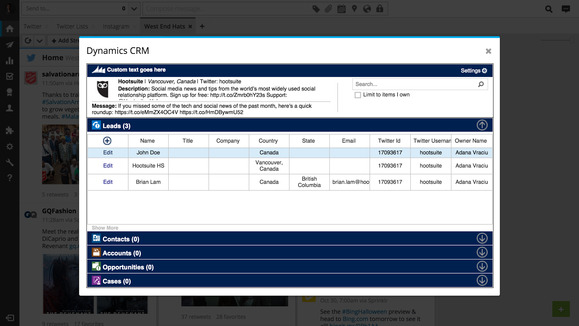 Users will also be able to bring up content from SharePoint in Hootsuite's dashboard, alongside other social feeds. People who use Microsoft's Yammer social network to connect with other people in their company can now view content from and post directly to it from the Hootsuite dashboard. They can also share posts from other social networks to Yammer from Hootsuite's dashboard to pull in outside content for discussion among co-workers. These features should give people who manage social media accounts for a company that's tightly integrated with Microsoft's services a single place to go in order to work with other people inside their organization. This isn't the first time Hootsuite has integrated with collaboration tools. Companies can also connect the social media service with applications including Google Drive, Box and HipChat.